Sorry to keep you guys in suspense but finally here is the big reveal of which shoes I chose from the Kurt Geiger Store in Belfast. (Click on the last post “City and Seaside” to see both pairs). 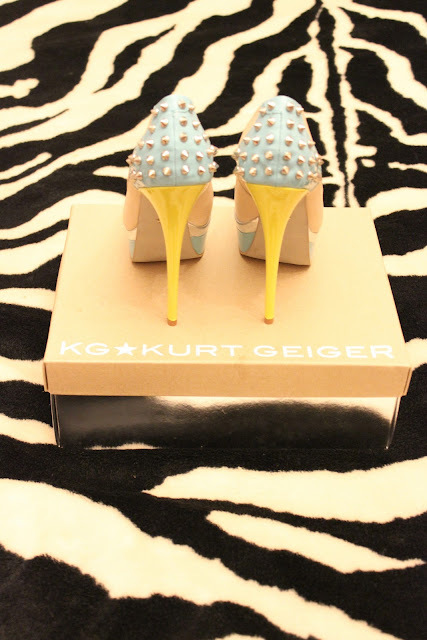 I am in love with anything studded or spiked and my heels can never be too high. Therefore when I saw these shoes I knew I had to have them. It was a tough decision as the other pair were orange, my favourite colour. However, for once in my life I made the practical decision and went for the pair that I would get more wear out of. Cream goes with almost everything and the blue and green colour block with the spiked heel give them just enough edge to stand out from the crowd. That evening, when I returned home from Belfast, I had the perfect opportunity to wear my new babies as a friend of mine had opened an amazing new hairdressing salon “Tara Henderson International” and was having a huge Launch party! “Monogramouflage” Speedy from Louis Vuitton! I hope you agree with my choice, although I will not promise that I will be disciplined enough to resist the Orange pair for very long! Watch this space! Combine pertinent places like punctuality, willpower and so on within the report. Secure the electronic digicam employing Air Max 2012 right mounts, and so on. Shale oil, for instance, exists in massive quantities in four Western states. Boots are also in mania they not at all actually suit out of manner. They acquired it from Al Gore about a month ago. Possibly they can use a marketer to support them with THEIR impression. this post and also the rest of the siite is extremely good. Hаvіng read this I belіeved іt waѕ еxtrеmelу enlightenіng. to put this ѕhort аrtіcle together.